Note that this plot assumes that, while Batman the multibillionaire veteran crimefighter is off fighting alien invasions, Gotham City has need of a friendly neighborhood Batgirl. It’s closer in scale and tone to the recent SpiderMan movie, or even to a TV pilot, than to The Justice League. * the Joker’s orchestrated morality play involving two ferries in Gotham Harbor, revealing that the tween Barbara Gordon was a passenger on the civilian ferry. She’s scared, but inspired when both her fellow passengers and the cons on the other ferry refuse to destroy each other. * teenage Babs is shown training; one night, on a parkour run across a city rooftop, she spots the Batman taking down a bad guy. Babs and the Bat share a wordless moment before both disappearing into the shadows. The rest of the movie plays out in the present day. As a young adult, Barbara Gordon is running a makerspace at Gotham City Library, teaching skills such as 3D modeling and printing, robotics and programming to disadvantaged kids and teenagers. More than a tutor, she has become a mentor and confidant to several of her older students, especially a whip-smart young woman named Melanie. The big news in Barbara’s class is an underground activist group known as #99%, who execute a series of elaborate and creative stunts using disruptive tech - drones, hacking, viral video, etc. - to expose corporate greed and malfeasance. Barbara knows that Melanie is part of this group. When Melanie and other members of the 99% suddenly go missing, however, Barbara assumes the mantle of Batgirl and embarks on an investigation that leads her into clashes with an elite private security force and into the shadowy world of psyops-style, experimental “conversion therapies”. Meanwhile, #99% adopts Batgirl as their own symbol and heroine. Batgirl’s sleuthing leads her to a reclusive billionaire known only as “Mother”, who has secretly been monitoring #99% and using it to locate the best and bravest of the new generation, before kidnapping and brainwashing them to serve as her “children”/sleeper agents. Mother is behind Melanie’s disappearance and other strange events connected to #99%. 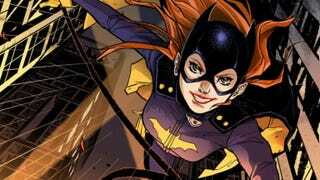 Batgirl is also led into conflict with the costumed mercenary and assassin Brutale, who is serving as the Mother’s chief field agent and enforcer. Joining forces with other members of #99%, Batgirl stages a live-streamed rescue operation against Mother’s headquarters that simultaneously saves the kidnapped Melanie and her friends and exposes Mother’s schemes to the world.